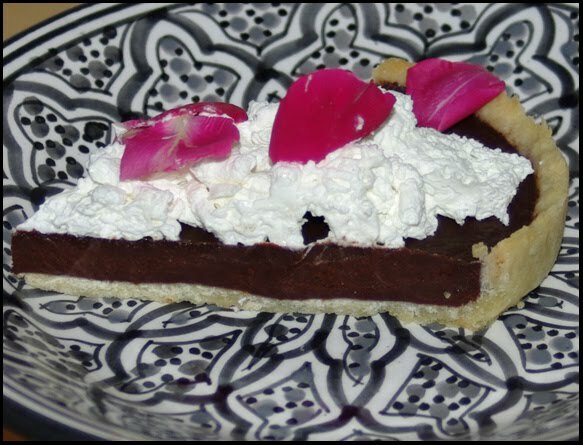 All of the blooming roses in our yard inspired me to make a chocolate tart flavored with a bit of rose. 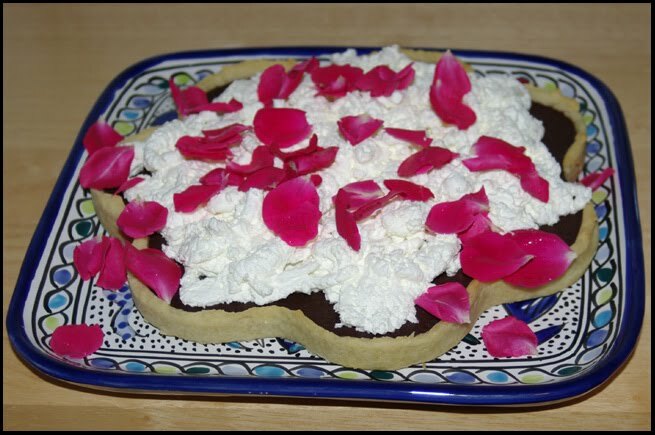 I made a basic ganache (cream and chocolate) for the filling, but I steeped some rose tea in the cream, and I added a bit of rose water for additional flavor. I topped the tart with basic whipped cream and rose petals. Sublime. The crust I used is Martha Stewart's Pate Sucree. It's easy to make and works well in a bottomless tart pan. For the filling, I made a bittersweet chocolate ganache. Once the tart shell was baked and cooked, I filled it with the warm ganache and let in firm up in the fridge. Here's a basic ganache filling recipe. This tart can easily be made vegan. Use vegan margarine to make a tart shell, and for the ganache, use a non-dairy cream substitute. In chocolate desserts I like to use MimicCreme. You can top the tart with berries or dust it with cocoa powder. Beautiful! I like the shape of the tart.